File photos of Bruno Mars, Jay-Z and Childish Gambino. These are three of the five nominees for the Grammys' Album of the Year category. The other two are Kendrick Lamar and Lorde. This is the first time ever there will not be a while man nominated for the category. If the 2018 Grammy nominees are any indication, the world of music is eager to honor diversity. 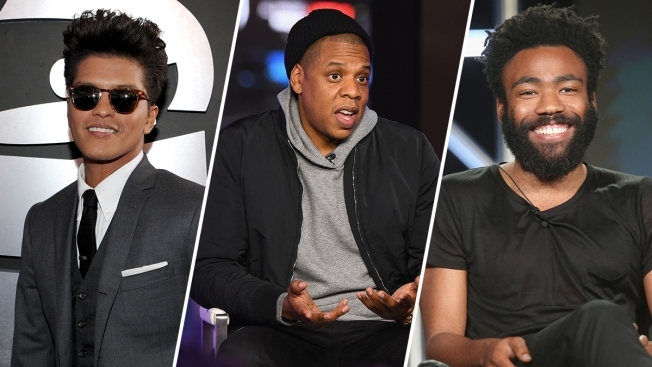 As fans studied this year's nominee pool, some took particular notice of the Album of the Year category, which features nods for Childish Gambino, Jay-Z, Kendrick Lamar, Bruno Mars and Lorde. Though the top honor clearly lacked a white male nominee, this moment also marks the first time in history that no white men have been nominated in the category. While some reports suggest it's the first time since 1999 that a caucasian male nominee was not included in the category, that is not exactly the case. In 1999, the band Garbage was nominated for its album at the time, Version 2.0. While the lead singer is a white female, Shirley Manson, the band's other members, musicians Duke Erikson, Steve Marker and Butch Vig, are white men. In any case, what seems to be a changing tide in the industry is a significant one considering the Recording Academy has come under fire in recent years for awarding Album of the Year to white artists like Adele and Taylor Swift instead of fellow nominees Beyonce and Kendrick Lamar. The category is not the only one that is clearly diverse. The "Record of the Year" category features nods for Gambino, Jay-Z, Lamar, Mars and Latin artists Luis Fonsi and Daddy Yankee featuring pop star Justin Bieber. As Recording Academy chairman Neil Portnow explained to Variety, the diversity present in this year's top categories is partly the result of a wide voting pool of 13,000 members and digital voting to the make the process more convenient. Plus, of course, the music that resonates with voters matches the climate of the present. "The results are reflecting the music of the times--hip-hop and urban music is pervasive in our society worldwide--not just in America," Portnow told the magazine. "So when that continues to be evident and evolve, this is a reflection of that."